The quasi-linear increases in CFC-12 and CO2 in the atmosphere between 1960-1995 have been utilized to estimate the uptake of anthropogenic CO2 in the ocean from 1980-1999 directly from CFC-12 derived ages (McNeil el al., 2003). 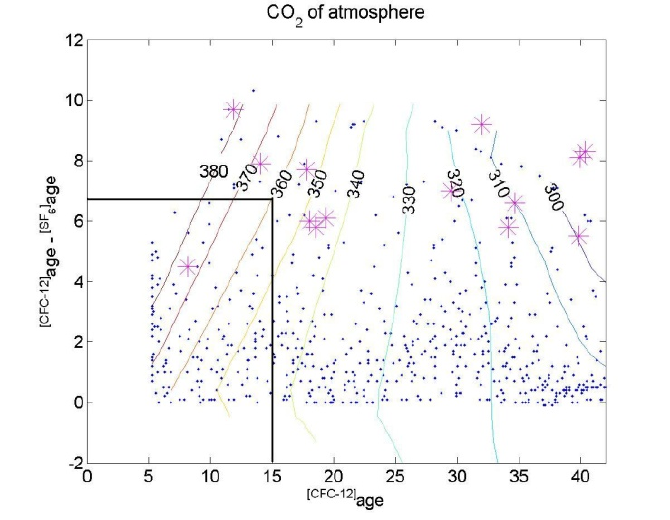 CFC ages have been used in the ΔC* method to estimate global anthropogenic CO2 uptake (figure on right, from Sabine, et al. 2004). There can be significant advantages in using multiple transient tracers to better estimate transit time distributions (TTDs), ideal ages and anthropogenic CO2 uptake. The figure (right) is from a 1-dimensional advective-diffusive tracer transport model of CFC-12, SF6 and CO2 in the North Pacific. As an example, for a given CFC-12 age (e.g. vertical line at 15 years), the corresponding CO2 value (contour lines) can vary (from about 340-370 ppt). The addition of SF6 age puts a much tighter constraint on the CO2 content (~360) of the sample (Bullister, et al 2006). Bullister, J.L., D.P. Wisegarver, and R.E. 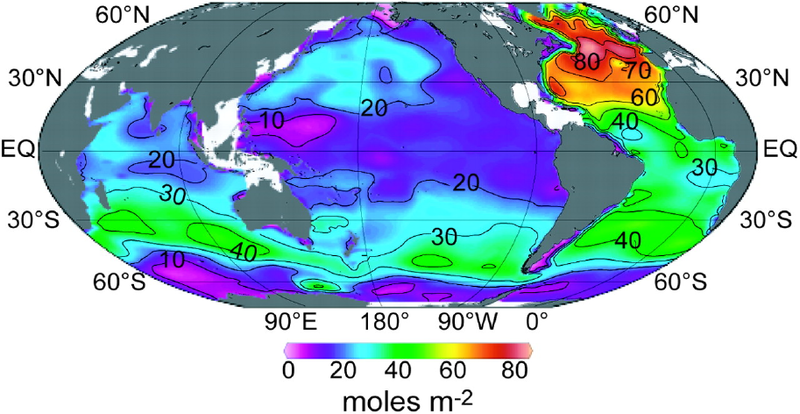 Sonnerup (2006): Sulfur hexafluoride as a transient tracer in the north Pacific Ocean. Geophys. Res. Lett., 33, L18603, doi: 10.1029/2006GL026514. McNeil, B.I., R.J. Matear, R.M. Key, J.L. Bullister, and J.L. Sarmiento (2003): Anthropogenic CO2 uptake by the ocean based on the global chlorofluorocarbon data set. Science, 299(5604), doi: 10.1126/science.1077429, 235–239. Global CO2 Inventory (Sabine et al., 2004). Click image to see full size figure. The figure is from a 1-dimensional advective-diffusive tracer transport model of CFC-12, SF6 and CO2 in the North Pacific. As an example, for a given CFC-12 age (e.g. vertical line at 15 years), the corresponding CO2 value (contour lines) can vary (from about 340-370 ppt). Click image to see full size figure.